This was the big news when I was still Houston. In a week, I heard 4 deaths, 2 celebrities and 2 workers in my company. What a week?! When I flew back, I was reading a Malaysian newspaper, theStar. 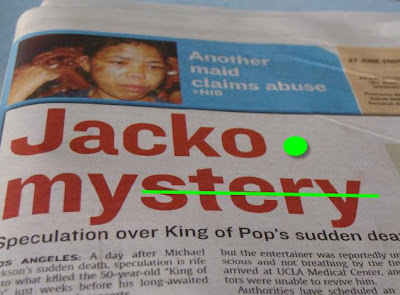 Nothing surprise, the front cover was about MJ which I had read tonnes of it in US papers. It was the front cover of the paper that I read in the flight. I never thought of that when I read the paper. How creative the sender was?! Condolence to MJ family. He was the first English singer I know, his song was the first English song I listened, his MV was the only MV that I never switch channel whenever it replays on the screen. I missed his concert when he came to Malaysia, too expensive for me and I told myself not to miss if he ever revisit Malaysia. That's all gone.